Recent legislative and policy developments in contemporary Britain have ushered in a new approach to criminal justice. The focus on criminal dispositions and welfarism has given way to a strategy which now involves the management of social exclusion, dysfunctional and anti-social families and situational crime prevention, leading to what has been widely characterized as the 'criminalisation of social policy' - and evidenced most recently by the anti-social behaviour and respect agendas. This book is concerned to explore, analyse and explain these developments. It seeks at the same time to situate the study of anti-social behaviour and response to it in the wider context of changes in the industrial and social structure, social polarization and inequality and the changing role of the welfare state in present-day society. 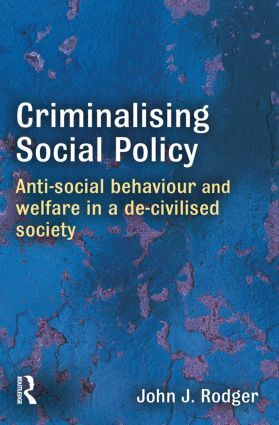 This book will be essential reading for students taking courses in criminology, sociology, criminal justice, social policy and related subjects.